Extract attachments in Bulk from PST File batch. Features to Maintain Folder Hierarchy of Mailbox Folder. Software support both ANSI & UNICODE Format PST File format. Supports Microsoft Outlook 2016, 2013 (32 bit) & below Versions. Extract Attachments files from Mailbox folder. MS Outlook Installation required for attachments extraction. Extract PST File Attachments in Batch User can add multiples PST Files in the software and extract attachments from multiples emails of PST files in one go. Software can extract all different type of attachments from Pst Files. 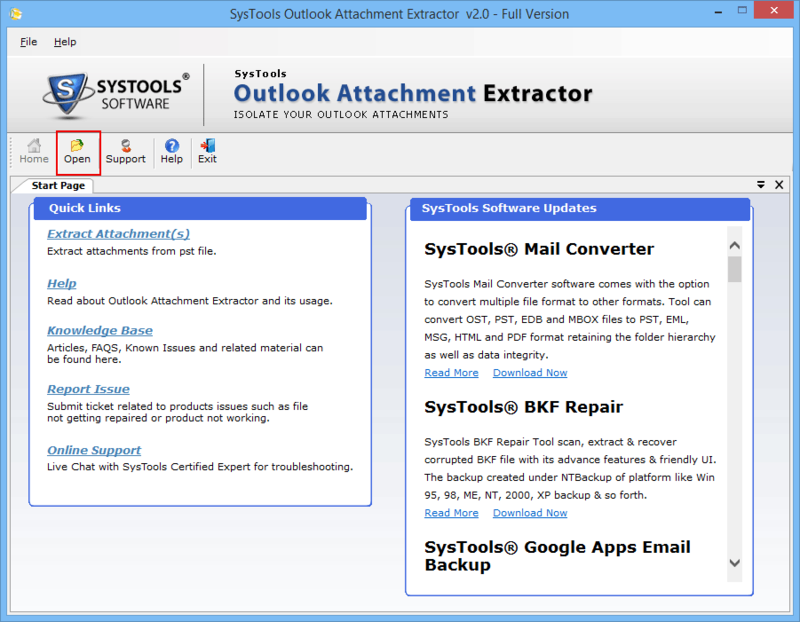 Outlook Attachment Extractor maintains the hierarchy of folder structure, keeping data impaired to avoid any confusion. Data related emails such as "to, from, subject, message body, header" is also maintained. Outlook Attachmments Extractor show complete progress details of of the PST files after extraction process. It will display details of PST file such as File name, Count , status , and the file path. . In Outlook Mail Attachment Extractor, user can select the desired location to store extracted file in the local system. After the completion of Extraction process, software will generate a CSV File report for each PST file hold information of attachments.Microsoft Outlook Attachment Extractor creates seprate folder to store attachments of longer paths. Simple and User friendly Single window panel interface, So that user can easily select single or multiple PST files freely into Outlook PST Attachment Extractor. To store attachments user can store in desire location of local system. Outlook Attachment Extractor - A Close Insight! 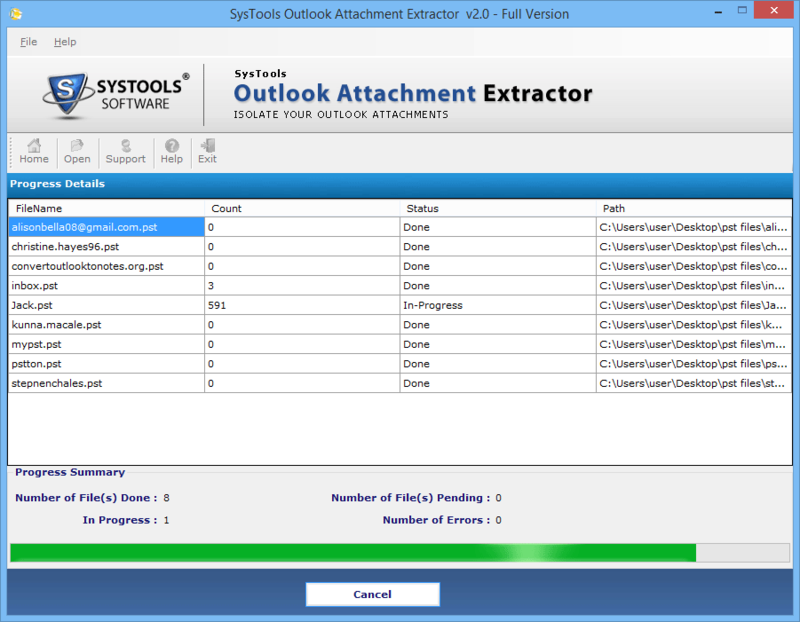 An Outlook Attachment Extractor tool is used to extract attachment from PST files and store them in a structured way. Since Tool can different types of attachment related to the Outlook Mailbox PST Files. Software support MS Outlook version 2013 and other below version. It also supports UNICODE & ANSI Format of PST files and derive data from it without changing the original message files. As there is no size limitation of PST files, So, a user can remove outlook attachments from large size PST files. It separates attachments from PST files in batch to extract emails elements easily. Some outlook users deal with hundreds of emails with attachments daily from others. These attachments hold various kinds of informations. It can be some product images, documents, videos, daily reports etc. To maintain these attachments and analyze information is a difficult task. Going through all these emails properly, attachments should be maintained properly show that user can easily view all the attachments and save its time. Also store all these attachments in different folder. Download & Run Software and click on Open Option. Select ADD File or ADD Folder option to select PST File. Select different Folder Hierarchy Option. Browse the location to store attachments of PST File in the local system. Click on Extract Option to start process of Extraction. Software will display the Progress Bar to show status of Extraction. After successful extraction of attachments, Software will display a message "Attachments Extracted Successfully". Click OK.
Softwares generates a CSV report for all those attachment extracted from PST Files. 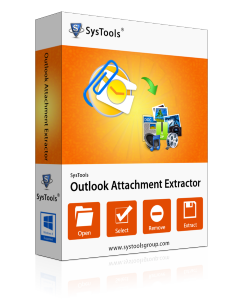 Outlook Attachment Extractor Tool Replies All Doubts & Queries! Is Outlook installation is necessary for software to run smoothly.? Yes, Outlook installation is necessary for operation software properly. It should be configured with POP3 account OR Dummy account. How many files can I add for attachment extraction process? You can add multiples files at a time to extract attachments from PST files. A user can also add folder consisting multiple files. Is software recover deleted data related to attachments of PST files? No, To extract attachments from Outlook PST files, files should be corruption free & should be accessible in Outlook properly. Does Software support Microsoft Outlook 2010/2013 & 2016 version? Yes, Attachment Extractor support latest version of Outlook 2016 & below version such 2013/2010 and 2007 easily. How can I remove duplicates emails from the Outlook PST Files? User can download Outlook Duplicates Remover to remove any duplicates emails in Outlook PST Files. 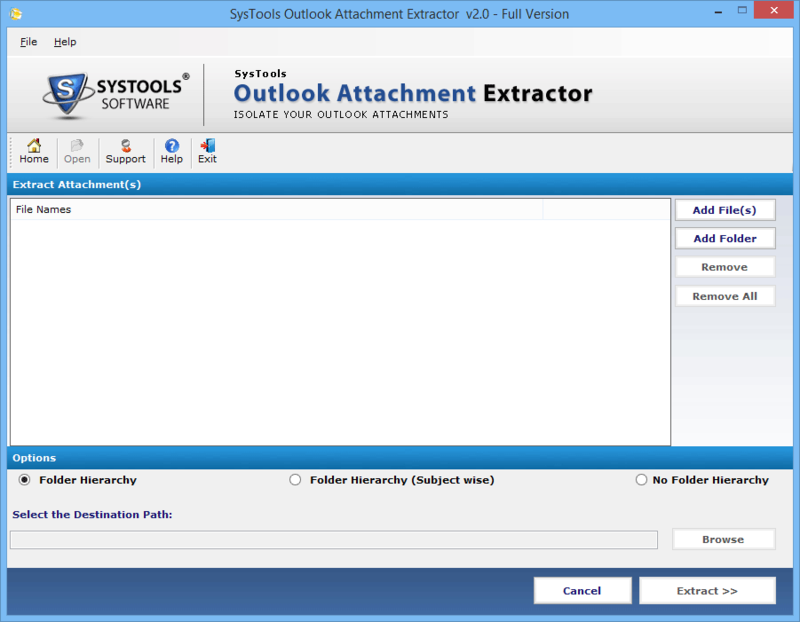 Outlook Attachment Extractor tool helps me to extracts attachments from large PST files. 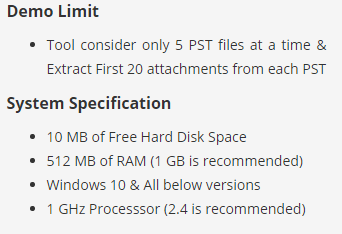 There is no file size limitation related to PST files, that help to extract my data such from PST easily. Great Tool to extract attachments of both ANSI & UNICODE format of Outlook PST files. I can derive information from multiples PST files in one go. Thanks to devloper. Features of Outlook Attachment Extractor helps me to extract attachments from multiples emails messages of PST files. It derives attachments related to mailbox files in hierarchy manner. While creating the backup of an ANSI PST file, need to extract attachment from the file so that all the attachment can be saved at a particular location. Hopefully, Outlook Attachment also supports ANSI file format, Tool saves my lots of effort and time.